It's time to bring the Jedi down. For years these peaceful people have been making it hard for the baddest and most evil of Sith Lords to have a good time. What can be done about such a thing? Well Darth Maul has a few ideas and each one of them involve his trusty double bladed lightsaber. He took it upon himself to challenge two of the greatest Jedi to ever live to a match of force powers. 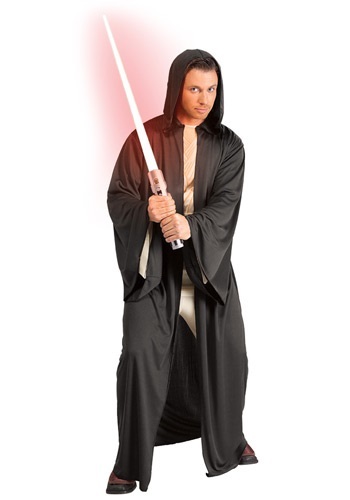 Now you can look just like the baddest of the bad in this great Star Wars costume. Just be sure to pick up one of our double bladed lightsabers to complete your look. In a galaxy far, far away there is a group of people who have joined together to embrace the darkside of the force, the Sith. These individuals practice doing the worst things ever while training to kill as many Jedi as possible. 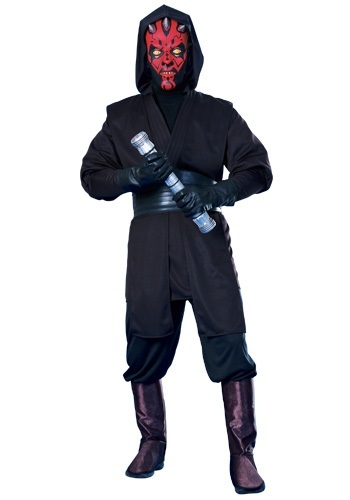 The most notable of terrible Sith Lords have been Darth Maul and Darth Vader and now you can join their ranks when you wear this great Star Wars robe! Not everyone was born in a galaxy far, far away, but that shouldn't stop you from donning some horns and training the ways of the Sith. Just plop this horns set on your head and you'll be ready to swing your broom around the house while pretending it's a lightsaber. During the battle of Naboo there was a epic fight that was happening on the surface below between two Jedi and a Sith lord. Darth Maul was taking on both Qui-Gon Jinn and Obi-Wan Kenobi at the same time and would eventually lose to Obi-Wan by being chopped in half. The Jedi order thought that they would never have to deal with the Dathomirian again, they were wrong. He came back to join his brother Savage Opress in seeking revenge with new set of robot legs. 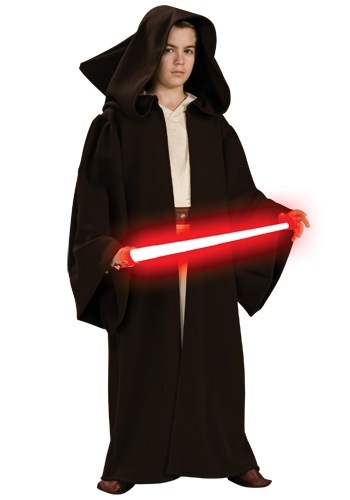 Now your little one can become the baddest of the bad guy's in this great Star Wars costume. Sith lords are an evil bunch. These practicers of the dark side of the force have always taken to being as bad as they can be. When Darth Maul first met a young Anakin Skywalker he tried to kill him and master Qui-Gon Jinn with his lightsaber. Then later on he would ruin Obi-Wan's day by taking his teacher's life. But then came a bad moment for the horned sith lord when he was chopped in half. Now your little one will be able take on the Jedi in this Star Wars costume. Being good is overrated! The darkside is where it's at! If you ask any Sith Lord about their time learning all the evil things that they've learned they'll tell you that it is a blast. Also the lightsaber you get will have a stylish red blade, which everyone knows is way cooler than blue or green. So now you can let your kid become just like Darth Vader and Darth Maul with this Star Wars robe. It's perfect to enjoy some darkside cookies in. Something about wearing this Darth Maul jumpsuit just makes you want to exact revenge on Obi-Wan Kenobi. 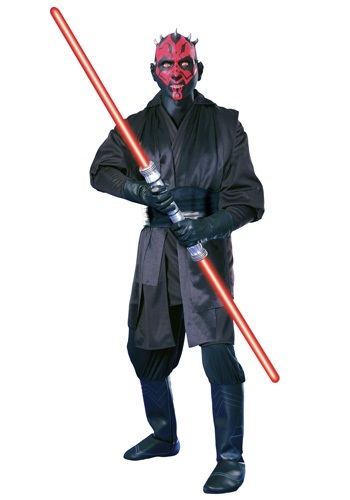 We're not sure if it's the red tattoos on the chest, or if it's the permanent "mean face" recreated on the included mask, or if it's just the fact that we think Obi-Wan is kind of a jerk for cutting the best Star Wars villain in two at the end of The Phantom Menace. Whatever it is, we think a little bit of this skin suit's dark side tendencies might just rub off on you when you wear it. 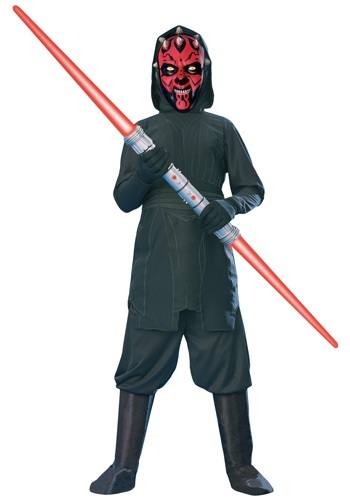 Become an apprentice under Darth Sidious with this licensed Darth Maul costume. 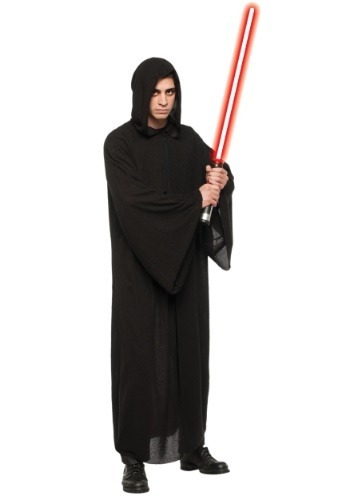 The costume includes a black, 100% polyester tunic with a hood attached to the back. A tie in the back adjusts the fit and the front is covered in raised appliqued detailing that mimics the look of wrinkled robes. The included pants has an elastic band around the waist and foam boot covers that fit with elastic bands. The black belt ties in back and has a foam piece in front. 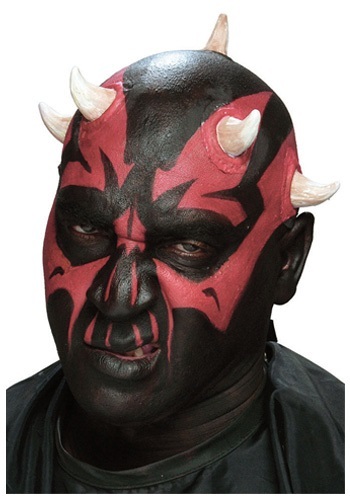 Finally, the plastic mask fits on with an elastic band and is molded into the shape of Darth Maul's face. The mask has slits at the nose and eyes. Dueling against Jedi will be nothing to you when you don the garb of this classic character. 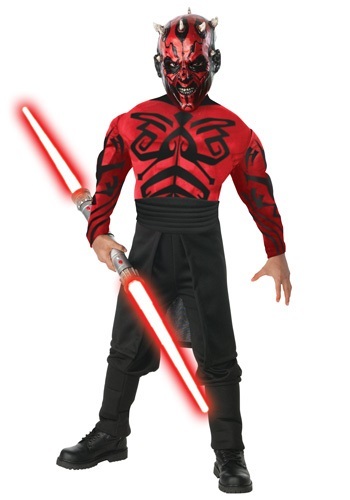 Become one of the fiercest Sith Lords in this Deluxe Darth Maul Kids Costume! Its molded foam chest gives a muscular appearance and the suit is printed with realistic details. Add a dual lightsaber and you're ready to seek your revenge! "At last we will reveal ourselves to the Jedi. At last we will have revenge. "When Darth Sideous was forming his plan on taking over the galaxy he called upon one up and coming Sith Lord to aid him in bringing down the Jedi, Darth Maul. This most evil of all Siths took it upon himself to take on both Qui-Gon Jinn and Obi-Wan Kenobi in a battle of lightsabers. These two Jedi have met their match in this vicious of all bad guys ever. 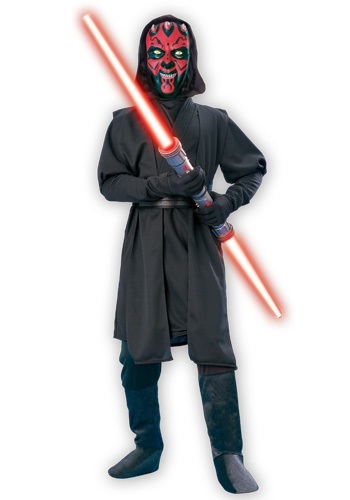 Now you can become a dark Star Wars villain in this great adult costume.